Employers VS Job Seekers: Same Strategies? 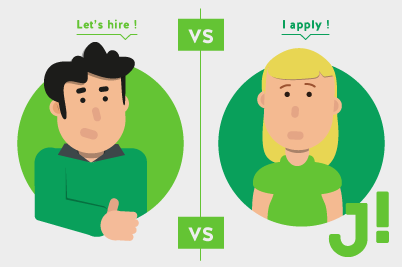 You are here: Home / Candidate / Le marché de l'emploi / Employers VS Job Seekers: Same Strategies? Are you satisfied with the results obtained with your job search? Have you ever wondered how the average employer prefers to fill positions? What is your main strategie? Here are, in order of preference, the main strategies that an average employer uses to fill positions and some solutions to make you stand out. Whether it is through the hiring of a contractor, a trainee, an acting employee or even a volunteer, the employer gets a lot of benefits from hiring within the company. First, the recruiter already knows the employee in the working environment. Second, the risk of making a recruitment error that could end costing the employer a lot is diminished. The employee is already familiar with the day-to-day operation of the company as well as its organizational culture. Also, this employee will need little supervision, and can be autonomous very quickly if he/she is not already! You can ask someone from your network of contacts who works in a company or an industry that interests you to keep you informed of openings. If you learn of an open position, don’t hesitate to get in touch with the right person and let them know that you are available! If an employer has to fill a position quickly, but cannot hire from within the company (see previous step) and does not want to go through a large number of applications, he or she will be opportunistic. Because of this, many employers will be open to talk to job seekers that are willing to demonstrate their skills. Furthermore, if there is an urgent need, recruiters will not hesitate to rely on both their personal and professional networks to find potential candidates. If an employer is referred a candidate from their network, the employer will more than likely assign that candidate a higher priority than direct applications. You can also use your network of contacts! Who knows, you might learn that a company in your field is hiring, or that someone in your network knows a good contact. Moreover, if you’d like to be noticed by employers you need to take the initiative! Be confident, reach out to them and demonstrate your skills whether it is by a carefully crafted email, LinkedIn, during a meeting or even as straightforward as a phone call. Take advantage of this opportunity and allow them to evaluate the knowledge, skills and attitude that you will bring with you if you get the position. As many organizations choose not to display the positions they have to fill, it presents a unique opportunity for individuals that pursue this route thus increasing the chances of obtaining privileged information. It is important to note however, that this approach requires a significant amount of effort. That being said, the consolation is that you don’t remain among the countless other anonymous job seekers out there and instead, stand out by demonstrating that you are outgoing and willing to go above the ‘call of duty’ in order to achieve your goal – a job. 3. Employment Agencies to the Rescue! Some employers will seek help from employment agencies to meet their staffing needs. In fact, some are not comfortable with recruiting or just do not have time. This strategy can relieve some employers of the complex process of managing a recruiting cycle. Although the mandate of an agency is to “place” staff, do not stay in the shadows and hope that they will do all the work for you! Instead, regularly follow up on positions that interest you because you are not the only job seeker to use this type of service. Yes, it’s competitive, so you have got to do more than just ‘hand over’ your resume. Contact the recruiter directly and let them know that you are actively looking – don’t forget to determine a follow-up date, it will help you to stand out! In the context of an emergency, employers will review the resumes that they have already received following discussions by email, phone, LinkedIn, etc., with potential candidates. Whether you send in your resume after a discussion with the employer, or after completing a job application form, it is always a great idea to check if it has been received. Then, nothing prevents you to check if your application is interesting for the company. The goal is for the recruiter to remember you at the right time, which is when he/she will be in a hurry to fill a position. There are also organizations that will post their positions on various web-based platforms. In this case, employers will have the challenge of writing the most catchy job offer in order to entice prospective job seekers to apply and obtain a pool of candidates that meet with most of the positions requirements. There are countless other prospective job seekers out there and in order to maximize your chances of getting an interview after applying for a job offer, take the time to craft an approach that’s specific to the industry. Ensure that you meet the requirements listed in the job description and then write/edit both a cover letter and a resume that’s specific to the industry. Furthermore, don’t hesitate to contact the company to find out if your application has been received. You could also try to contact the recruiter to briefly present your skills, why not? It could make a difference! Inspired by What Color is Your Parachute by Richard Nelson Bolles.